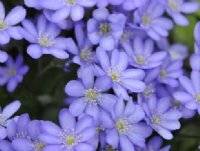 One of our Star series of hepaticas. A highly attractive evergreen perennial with kidney shaped deep green leaves having three lobes. These are borne usually after the flowers which rise first in early spring, usually around mid march. The plants we offer here are vegetative divisions and will have one or two growing points, the flower colour is a two-tone blue with the centre of each petal paler as in the photo and the petals are quite broad making a nice flower shape. White anthers compliment the appearance.